When I started this blog, I said that some of what I write may be funny and some might be sad and that it might get personal. So far it has been mostly funny. This one will be sad and personal. I'm heading to San Diego, a city I have traveled to many times over the years. Know it well enough to drive around without a map most of the time. I've always looked forward to the visits there-mostly with family enjoying the great weather and the cool downtown that overlooks the harbor. However, this trip is different. I'm going there to spend some important time with my brother, Tony, who has incurable cancer. Those were the words he used in an e-mail he sent to family members back in January. Tony was diagnosed with esophagus cancer in the fall of 2011. He immediately started treatment at MD Anderson in Houston and eventually had a resection of his esophagus in June of 2012, but not before he took his family to a long-planned trip to Florence,Italy, a place he dearly loves. He came through it clean and without complications and returned to work as a pharmacist as soon as he could. In December of 2012, a routine scan detected that the cancer had moved to his liver and "was incurable". I remember reading those words for the first time, then many more times after that. As hard as they were to read, I wondered what it would be like to have to write those words. He went on to say that he was grateful for the time he had left so he could put things in order and spend as much time as he could with his family-- that many people die without the benefit of the time to prepare. And that he wasn't afraid because his faith was strong. That tells you most of what you need to know about Tony. 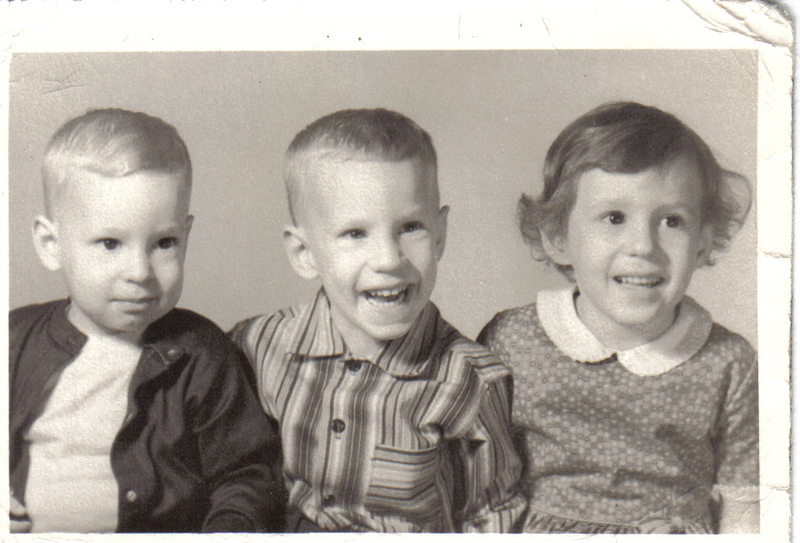 Tony was my first "little brother", the 3rd child of 8, born after my older sister Shelley and me in Oskaloosa, Iowa. I have several charming pictures taken when it was just the 3 of us, taken when our parents could still afford to have pictures taken, or cared to have pictures taken. Eventually another brother, then a sister and soon there were 5 boys and 3 girls in an 11 year span of time. No wonder our mother was elated when the birth control pill was released. Tony on my new cool Sting Ray. 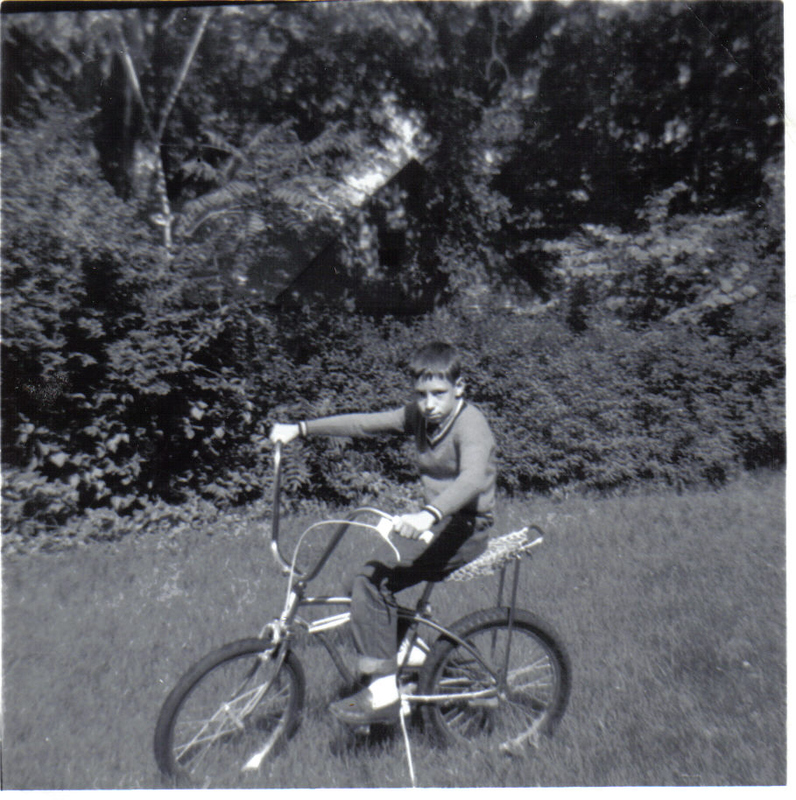 I have fond memories of the two us doing what little boys do-riding bikes, exploring the neighborhood, building forts. Tony was the trumpet player in my junior combo called the "Burnished Brass" where we played Herb Alpert and the Tijuana Brass covers at school events. He tagged along on my paper route until he got one of his own. We walked home from school together and ditched our brother Joe just to be mean. 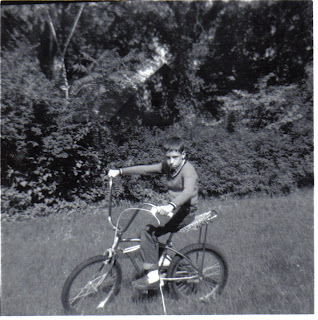 When I won a brand new Sting Ray bike in a paper route contest, I gave Tony my nearly new 26" inch bike that I had bought with money I saved. He followed behind me to junior high where he became his own person. A much better student and a sharp dresser, Tony was the " cute brother" and I was the one with the " good personality". He was named best dressed 7th grader in the school newspaper. He did not follow me or any of our other siblings to work at McDonalds, choosing instead to work at a neighborhood drug store, a job he kept all the way through college at Drake University where he received his pharmacy degree. Conservative in his demeanor and behavior, conscientious and studious, in many ways we were opposites. But we always remained brothers. There was rarely a cross word or difference that mattered. We've maintained a friendly, cordial relationship throughout our adult lives. Tony married his college sweetheart, Patti and they moved to San Diego to pursue dual pharmacy careers, raise two daughters and live their strong Catholic faith. Their daughter Maggie, is a special needs child and the love and sacrifices they both made for her were selfless . It seems like we just gradually saw less and less of each other over the years, as was the case with mostly of our siblings, separated by long distances. When our father was living in San Diego, Tony assumed the responsibility of looking after him and when he died, took care of managing his affairs. Always responsible, always considerate, always dependable. Tony was the one, of all my siblings including me, you never had to worry about, who just seemed to always do the right thing. He's lived a good life, taken care of his business and loved his family. He won't get to enjoy his retirement that he has earned. He won't get to grow old with his wife. He most likely won't be able to walk his daughter, Laura, down the aisle. He won't get to know his grandchildren. And it is not fair. And it makes me angry. And it makes me sad. So my business in San Diego, along with my sister Shelley, is to spend time with him while we still have some. To just be together while he is still able to walk around and enjoy the day. Before the chemo gets too rough and before his liver stops working. This is not a trip I ever thought I would make but it is an opportunity for me to be a big brother once again. In talking with him early this week about our trip out, he mentioned that he and Patti go to Mass on Saturday afternoon. That was the only thing he had planned. I can't remember the last time I went to mass, but I think I will ask if I can join him. He says he is not afraid and think I know why.